Tech Works Model System 21 is a complete cost, effective, assembly that includes a high- quality 8″ loudspeaker, 25V transformer and perforated steel grill. This unit is made to “Blind Mount” in to hard ceilings. 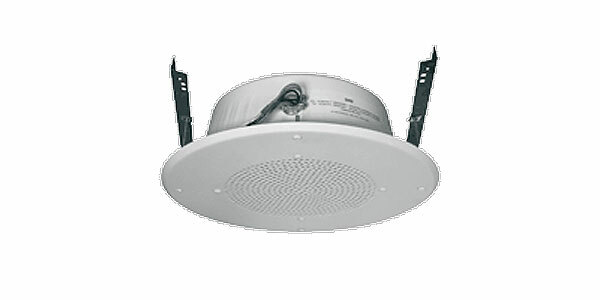 The package includes a UL listed back box and mounting rails so that the installer can cut a round hole in an existing ceiling, connect the wires, and push the speaker up into the hole. The System 21 features a conventional cone design loudspeaker with a 1″ diameter voice coil to reproduce voice and music with excellent response and superb overall performance. The System 21 includes a factory mounted 25V transformer. The 25-volt audio transformer has taps in 3 dB increments from 1⁄4 watt to 5 watts. The System 21 comes complete with a UL Listed metal enclosure for plenum rated ceilings and all mounting hardware.